Snake Lake is a 28 peg uniform snake shaped lake which is standard 13m wide, with an average depth of 4ft down the middle to 2ft in the margins. This purpose built water for the commercial match angling holds nothing but carp from 1lb to 7lb, making it a perfect venue for the club and serious match angler who’s looking for some serious sport on the pole. 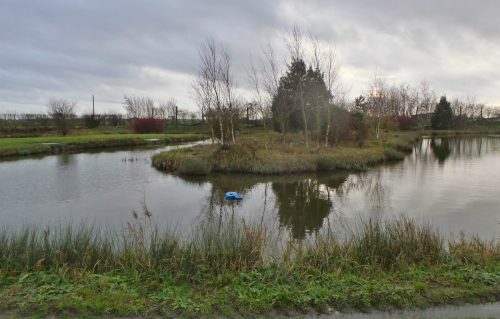 To make the frame on this well stocked venue you will require at least 80 – 90lb in the warmer months, with the current lake record standing at over a superb 200lb. Feed 3 or 4mm pellets and fish 6 to 11mm soft pellets down the middle for larger fish. Feed small cubes of luncheon meat or corn in margins, fish single or double corn or 8 to 10mm cubes of luncheon to pick out one or two better sized fish. Remember to feed little and often to keep the fish interested. As weather warms up look to catch mid water towards far edge on pellet,maggot or caster feeding regularly with a catapult.